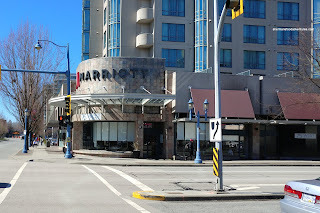 I'm sure you've heard me go on and on about hotel restaurants on this blog for the past 10 years. At first, many existed as a means to provide a standard and safe menu for the weary traveller. Hey, appeal to the lowest common denominator and most people will go away fairly satisfied, if not being rather boring doing so. However, as we've seen in the past decade, there has been a shift towards being more appealing in terms of decor and food choices. 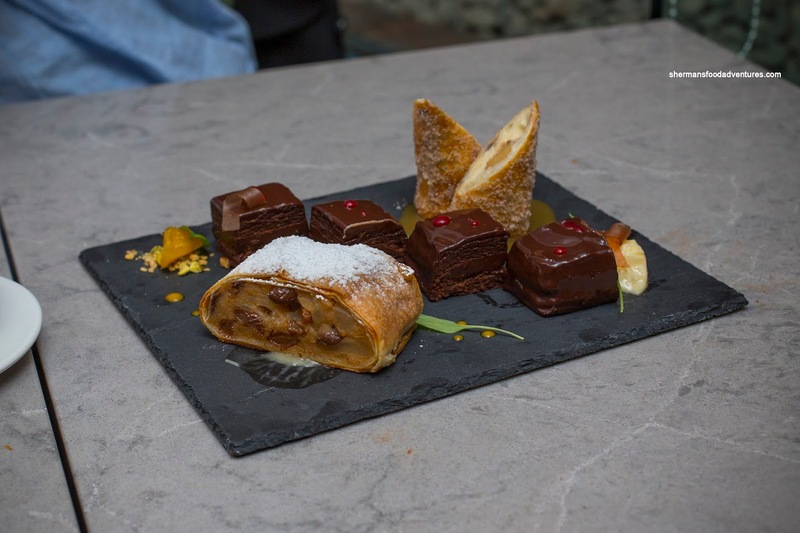 In fact, there are risks being taken, offering up a wide spectrum of eats such as The Victor in the Parq Hotel. Part of the same hotel chain, the Vancouver Airport Marriott has updated their long-standing restaurant, The American Grille, into 75 West that promises more excitement for travellers and locals alike. Jacqueline and I were recently invited to see and taste theses changes. The first thing we noticed was the modern decor that brightened up the room. Secondly, they added many more menu items that focuses on sharing plates. As such, we started with some of them including the Pork Belly Adobo. 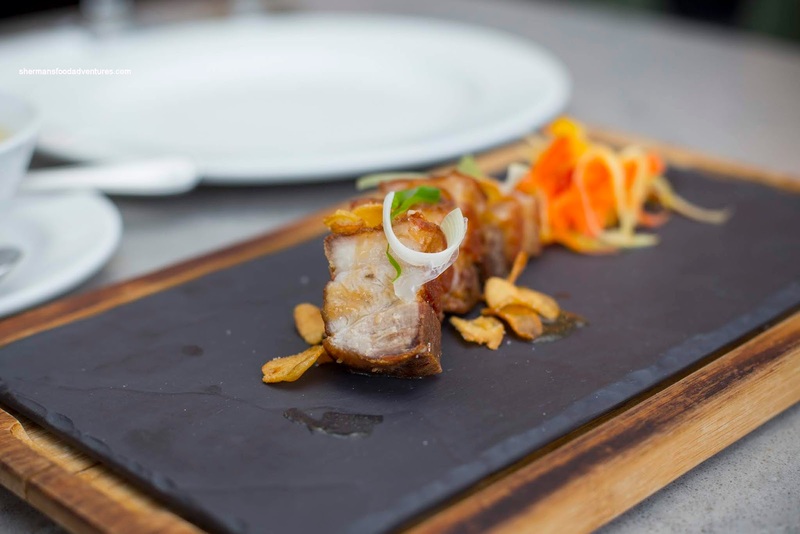 There wasn't anything bad to say about the pork belly as it was meaty with just enough fat to add the classic fatty luxuriousness to the dish. While moist inside, the outside was crispy and the crackling was akin to Chinese roast pork. This was all lightened up by the tangy and sweet adobo sauce drizzled on top. 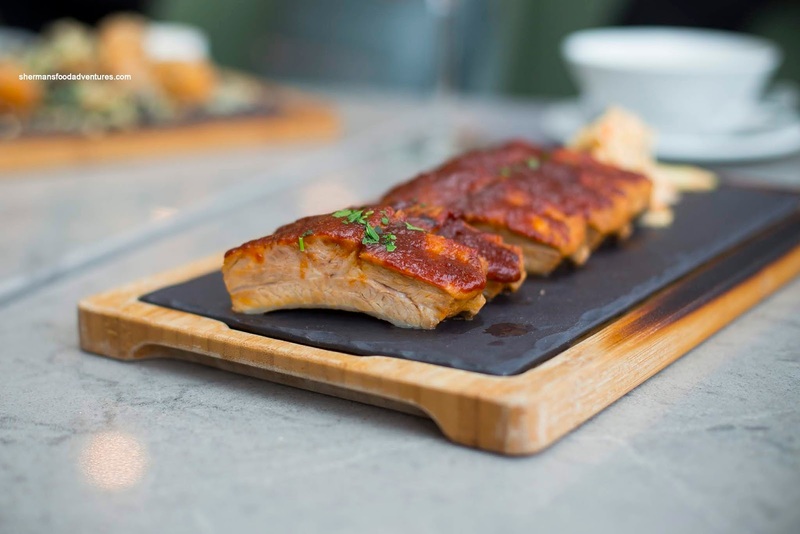 Something a bit more conventional was the half Back Ribs conveniently cut up for sharing. 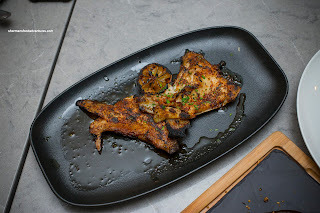 These were the typical par-cooked grill finished version, but with that, they were done right. They were meaty, tender and almost juicy with a tangy and sweet BBQ sauce slathered on top. 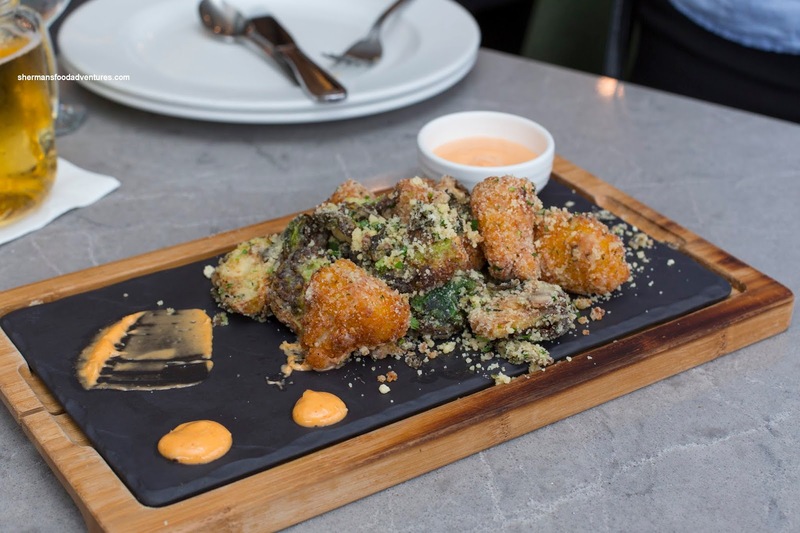 It was suggested we try the Fried Cauliflower and Brussels Sprouts and boy that was a good call. Sure, many different places offer this item on their menu, but this one was a bit different since it was liberally coated in parmesan. Hence, this was nutty and salty without the need for anything else, but it did come with spicy mayo. Although fried until crispy, the cauliflower and Brussels sprouts were still firm with a bite. Beyond the saltiness of the parm, there was truffle oil and garlic to provide layers of flavour. 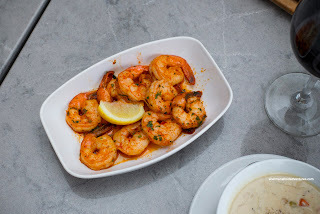 Back to the classics, we had the Prawns sauteed in garlic, paprika, lemon juice and EVOO. Similar to the Spanish tapas version, the prawns were meaty with a snap while sporting a noted smokiness from the paprika. Lots of garlic as well as enough salt meant this was impactful. 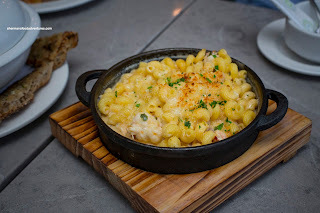 Whenever there is Lobster Mac n' Cheese is on the menu, I order it. So that we did and it was a fairly large portion. It wasn't apparent at first glance that hidden underneath the noodles were big chunks of bouncy lobster. I found the noodles to be fairly al dente considering the amount of sauce on the bottom. There was a cheesy creaminess from the aged cheddar, gruyere and mozzarella, but a bit more sharpness would've put this over-the-top. 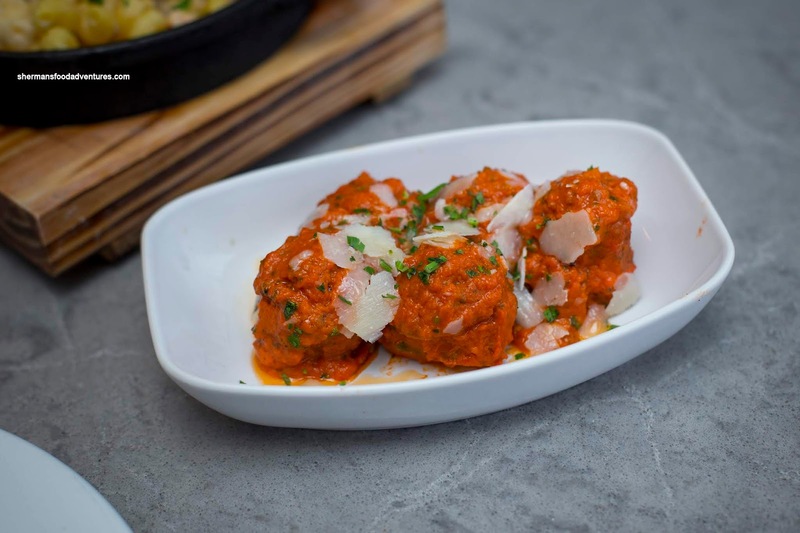 Interestingly, we decided to combine our order of Meatballs with the mac n' cheese and it was the perfect combination! 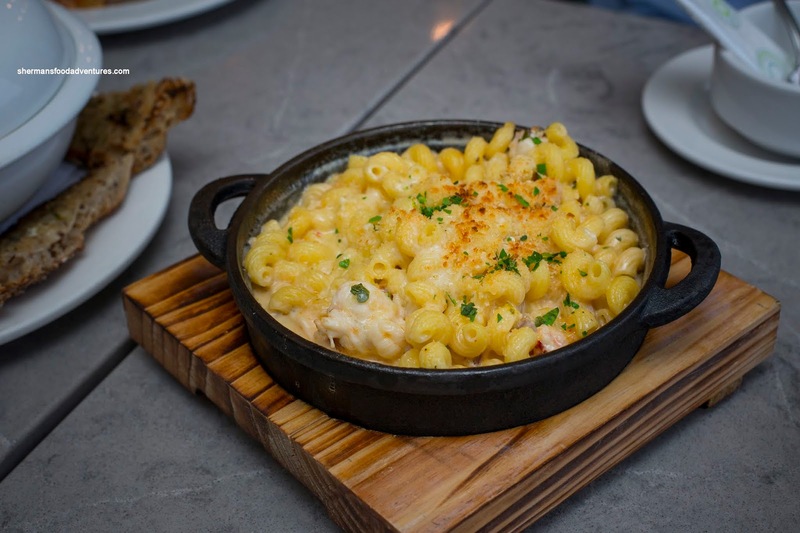 The tangy herbed chunky tomato sauce added the brightness and zip that brought the mac n' cheese alive. That also meant it was a great compliment to the meatballs as well. About those meatballs, the texture was definitely meaty and lean with little filler. Something you'd normally find on a Japanese Izakaya menu shows up on the 75 West Menu under the share plates - Blackened Halibut Collars. A bit gutsy and a little out there, but I applaud them for doing so. For me, I'm well-versed with fish collars and this was done right. Smoky and crisped up on the outside, the tender halibut was cooked just right. There was a nice rebound texture as well as the natural sweetness of the fish. A very simple dish prepared in a quasi-Japanese style. 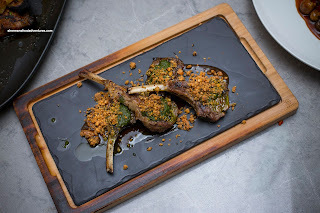 Instead of going for their full-sized version, we got the Lamb Chops (essentially 1/2 a rack of lamb) with dukkah and chimichurri. We asked for the lamb to be prepared medium and it arrived as such. Hence, it was tender and moist without being too rare. The combination of nutty dukkah and brightness of the chimichurri provided all of the necessary flavour. 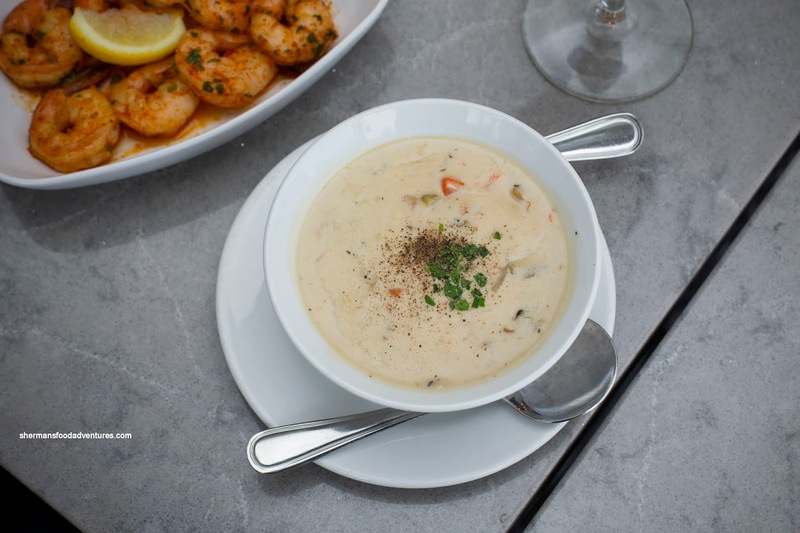 Our last two small plates consisted of the West Coast Chowder and Truffle Fries. 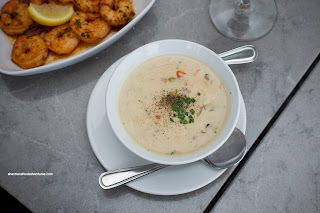 At first, I was a bit disappointed that the bowl of chowder was fairly modest in size (a little deceiving though as the bowl was decently deep). However, one spoonful and I quickly understood why it wasn't bigger - the darn thing was super creamy! This was a good thing though since it was smooth and rich while being mildly briny and sweet. It was chock full of seafood including big chunks of tender fish. 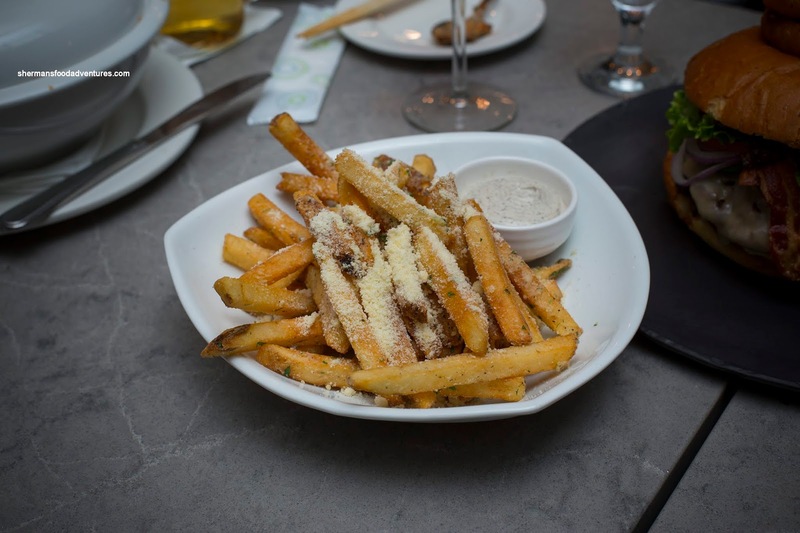 Now the side of truffle fries were actually something we ordered along with the Big D Burger since we couldn't have a burger without fries right? As for the fries themselves, they were pretty standard fare. They were crunchy and truffly with an aggressive dusting of parmesan. So there wasn't any absence of impact even without the side of truffle mayo. 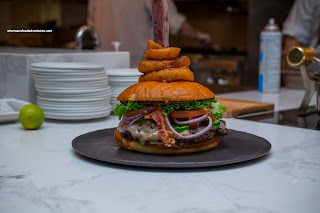 So I mentioned the Big D Burger in the previous passage... Well here it is in all its glory! 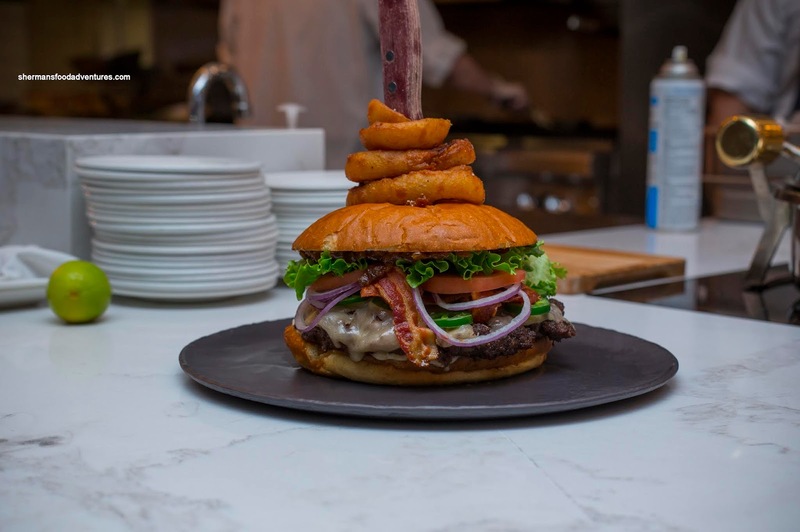 This monstrosity sported a 2lb house made AAA beef patty, tomatoes, lettuce, red onions, bacon, jalapeno, jack cheese, roasted garlic mayo and red relish topped with onion rings. Pictures don't do this justice as the diameter was as big as a dinner plate. Now shock factor is one thing, but how did it eat? Well, I'm happy to report that it was actually pretty good! Although the meat patty was cooked all-the-way-through, it wasn't overly dry. With all of the ingredients combined, it ate like a fully-loaded burger, but just bigger (yes we had to divide it into quarters). 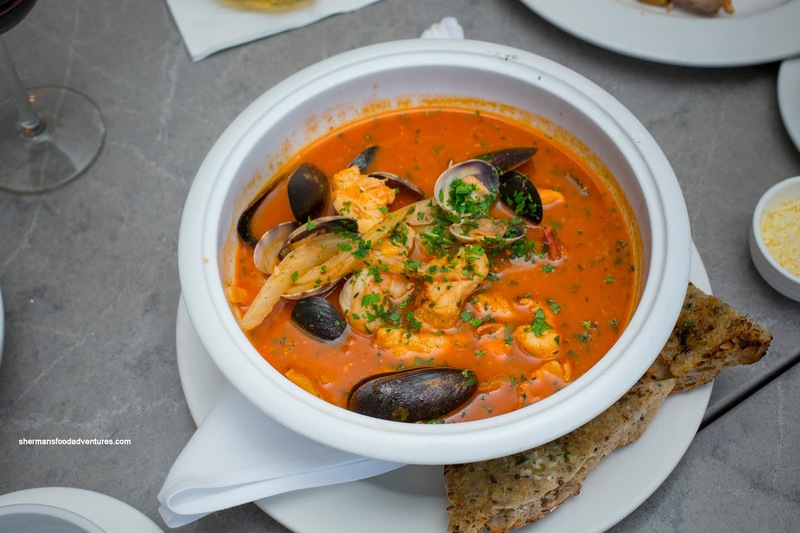 Onto something lighter, the Seafood Hot Pot consisted of prawns, halibut, salmon, mussels and clams in an orange tomato fennel broth. Aromatic and only a bit rich, the broth ate well with a tang and sweetness. There wasn't as much brininess as I would've expected, but the ample well-prepared seafood made up for that. Loved dipping the bread into the broth. For our meat main dish, we selected the 10 oz. 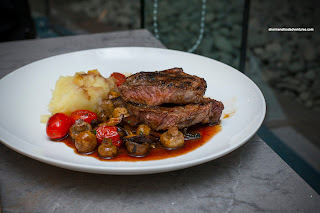 AAA Rib Eye with roasted wild mushrooms, baby tomatoes, roasted garlic mash and red wine jus. It was prepared medium rare where it was very tender while still meaty (sometimes, I find rib eye hit and miss in terms of texture, but this was excellent). For dessert, we had 3 items including Apple Strudel, Chocolate Decadence Cake and Xango Cheesecake. Remarkably better than their previous version, the apple strudel was full of sweet raisins and apples. It was nice spiced and encased in crispy phyllo. Not too sweet and rich with chocolate, the decadence cake was flourless and had layers of ganache with raspberry coulis on top. My favourite of the bunch was the cream cheese-stuffed fried tortilla with caramel sauce. Unique and actually not heavy, I got my cheesecake fix without feeling like I ate a brick. Beyond this visit, I've been to the American Grille quite a few times in the past for dinner, lunch and some tastings. I always found the food acceptable for a hotel restaurant. It is nice to see that they have elevated the menu to include more choices while including some favourites.